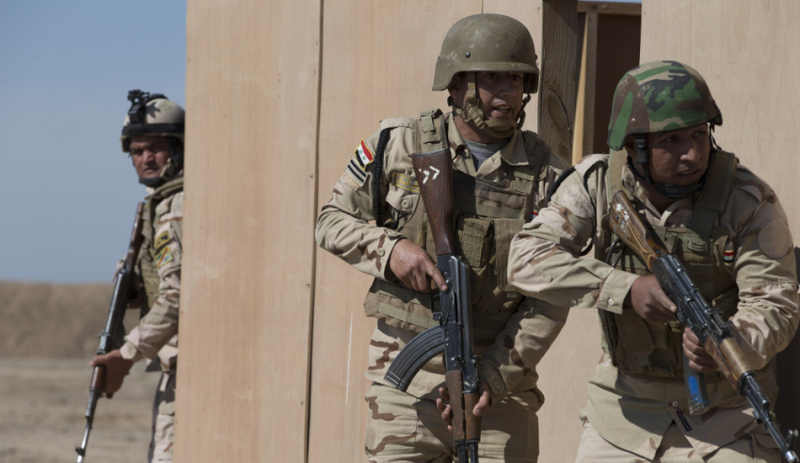 Iraqi Army soldiers conduct a room clearance under observation of Australian and New Zealand military trainers during a combined arms training activity as part of the Officer and Junior Leaders Course at Taji Military Complex, Iraq. Image via Commonwealth of Australia, Department of Defence. Defeating terrorist groups like al-Qaeda (AQ) and Daesh (ISIS) will require more than military means, a new report from think tank Australian Strategic Policy Institute (ASPI) has argued. In his latest report, director of the National Security Program and head of the Counter-terrorism Policy Centre at ASPI Isaac Kfir, has said a deeper understanding of the ideologies and belief systems of the terrorist groups is needed to defeat them. While AQ is not engaged in as many major attacks as it once was, Kfir argues the group's main role is a driver of ideology. "In 2018, it’s more appropriate to see AQ as not only a terrorist group, albeit one that’s less engaged mass-casualty attacks – the last major attack mounted by AQ was the Charlie Hebdo shootings in 2015, for which Al-Qaeda in the Arabian Peninsula claimed responsibility – but as the progenitor and promoter of a distinct theological-historical- political ideology," the report said. "The key to understanding AQ is to recognise its communication strategy, which interweaves pragmatic and perceptual factors. The pragmatic factors are security, stability and livelihood, whereas the perceptual factors draw on such concepts as ‘the Other’, crisis and solution. These factors are revealing because they focus on two principal themes: adopting the AQ mantra means participating in a program of action aimed at saving the umma (the Muslim community) from those who wish to destroy it, and thus joining a select group of enlightened individuals." Kfir argues that understanding the AQ strategy and ideology is to understand the 'us' versus 'them' narrative they have created, which holds ‘them’ – the West – responsible for the suffering of ‘us’ – defined as ‘all true Muslims’. The report argues the attraction to the 'us' is a form of a coping mechanism that presents the world and issues through "a simplified binary lens". "We need to recognise that al-Qaedaism provides a coping mechanism because it presents the world and issues through a simplified binary lens of ‘them’ and ‘us’, ‘good’ and ‘bad’, the exploited and the exploiter. Simply, we need to come up with better ideas if we are to win the ideological war," the report said. And while the international community has shown a determination to defeat AQ and its derivatives since the September 11 attacks of 2001, Kfir argues 'hard power' has limited value and efficacy. "It’s estimated that Daesh has lost around 60,000 fighters, and most of the AQ leadership has been eliminated, and yet threat levels in many countries remain high, and both AQ and Daesh appear to be making inroads into central Asia, sub-Saharan Africa, and even Latin America and the Caribbean," Kfir wrote. "As AQ and Daesh transform, there’s a need for a recognition that hard power has limited value and efficacy. First, because al-Qaedaism exploits grievances, encourages social divisions through overreaction and unrealistic demands, and provides a program of action, policymakers must become more conscious that their actions and words will become tools used in the radicalisation process. "Second, we need to recognise that AQ and Daesh have identified a large group of people who are in their teens and 20s and are presenting them with an ideology that explains to them why they aren’t benefiting from globalisation or why they’re experiencing discrimination and hardship. Ultimately, what al-Qaedaism offers is a binary choice: join us, the enlightened, and be willing to sacrifice everything, and in return we shall give you a purpose (including retribution and salvation); or oppose us and die." Kfir summarised that defeating AQ's narrative will require counter-messaging campaigns to be loud, effective and international in their scope, but will also require the removal of conditions fuelling AQ's binary narrative. "Accordingly, if we are to challenge al-Qaedaism, we must remove many of the conditions that fuel the narrative, which means properly and honestly addressing allegations of moral relativism and expanding our investment in people and development, primarily in spaces where human insecurity is pervasive. This is because, if we won’t the Salafi-jihadis would," he wrote.